"Sampath Speaking" - the thoughts of an Insurer from Thiruvallikkeni: Xanda, son of Cecil - becomes victim of big game hunting !! Xanda, son of Cecil - becomes victim of big game hunting !! பட்ட காலிலே படும் கெட்டகுடியே கெடும்~ a Tamil proverb; equivalent could be ‘misfortune never comes singly’ !! Remember the famous Cecil getting killed by trophy hunters !in 2015 – now reports state that a son of Cecil the lion has been killed by trophy hunters in Zimbabwe. Xanda was six years old and had fathered a number of cubs himself. He was shot on 7 July just outside the Hwange National Park, not far from where Cecil died, but news of the death only became public later. Some may not condemn the killing in the name of Trophy hunting ~ shooting with high precision killer tools, an unarmed unprotected animal, be it a Lion – the gadgets track it, the precision equipments dart it, and what is game about the killing ? - it is legal and some Governments promote it to make money in the guarded area where animals do not have any protection from human predators armed to the teeth. Xanda was the pride male in a group with two adult lionesses and cubs which roamed near the boundary of the national park. “He was shot 2km from the park boundary ! - lot of the hunting happens right on the boundary, because that is where the animals are. 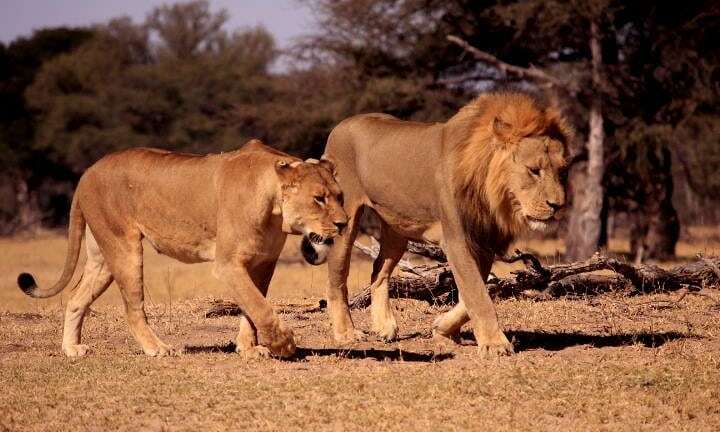 Xanda’s death may not pose immediate danger to the 550-strong lion population in Hwange national park, which spreads over 15,000 square kilometres, but still would only be better if it didn’t happen. Guardian reports that the Operator of the game hunt was ethical and legal quota for the hunt NS has killed several collared lions in the past too. The death of Cecil the lion in 2015, killed by US dentist Walter Palmer, led to widespread criticism of the trophy hunting of lions, which has become a big business with the number killed tripling to 1,500 a year in the last decade. Lions have lost 90% of their overall population in the last century and only about 20,000 remain. Though it is game to some, and money to some others, it is cruel manslaughter and needless killing, a recreation for shooters and death for the majestic animals. Every animal deserve our protection, not bullets. While it is a game in Zimbabwe, trophy hunting is banned in Botswana and Kenya. If it is valour, man should jump and fight animal with bare hands –sure that too is needless – but what is the charm in killing an animal with brute force of a gun combined with detecting technology. Cecil, who was 13 when killed, was believed to have had 13 surviving sons and daughters and 15 known grandcubs as of June 2016.Oxford University’s Wildlife Conservation Research Unit maintains a website about Cecil and a page for donations.Xanda which has been killed was reportedly 6 and had its own progeny. Authorities were able to identify the animal because he had an electronic tag. American trophy-hunter Walter Palmer, from Minnesota, paid £45,000 to hunt and shoot Xanda's majestic father, easily recognisable by his black mane which helped make him Hwange's biggest tourist draw. The son of Cecil has been shot dead by another big game hunter - two years after his father was killed more or less at the same spot, it has emerged.